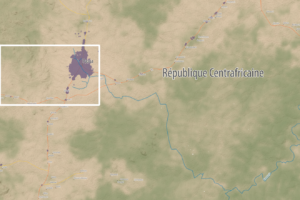 Basemaps of Ouham-Pendé to support conflict analysis and peacebuilding efforts linked to transhumance activities in northwestern Central African Republic (CAR). 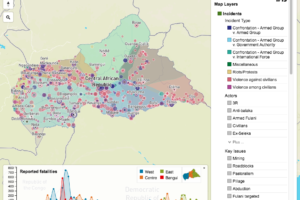 New webmap on the longstanding crisis in the Central African Republic (CAR), pointing out that access to resources remains the predominant driver of both armament and conflict in CAR. 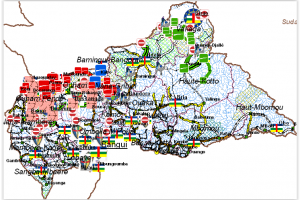 IPIS puts roadblocks on the map as key mechanism of conflict funding besides natural resources. 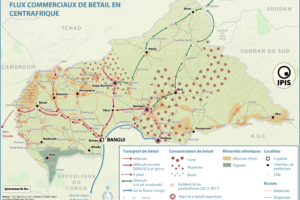 This map (in French) presents the main pastoralism corridors as well as incidents related to pastoralism from 2012 till 2017 in the Central African Republic. 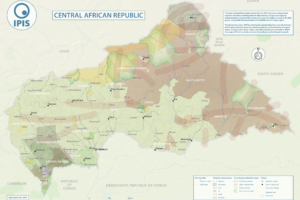 This A0 map displays the most exploited natural resources in the Central African Republic. 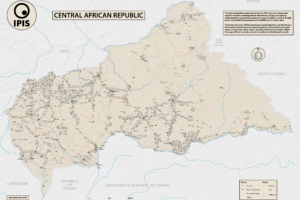 A clear map presenting the main roads and villages of the Central African Republic. 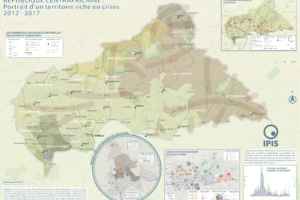 This poster (in French) is a compilation of maps and graphics related to the situation in the Central African Republic. 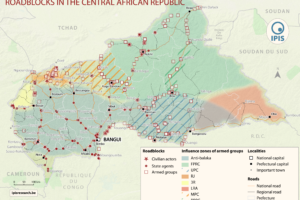 IPIS analyses the conflict dynamics in the Central African Republic (CAR) since the outbreak of the latest crisis in September 2012 up to September 2014. 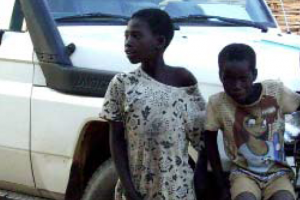 This report hopes to provide an overview of how the Central African Republic got to where it is now, as well as to present the means to further our understanding of the current situation. Although the country is scarcely populated, it is tormented by a multitude of armed actors. These belligerents use their weapons for a diversity of reasons but they have one thing in common: each of them would be a weak opponent for any well-organised state, but then this is exactly what the country lacks.